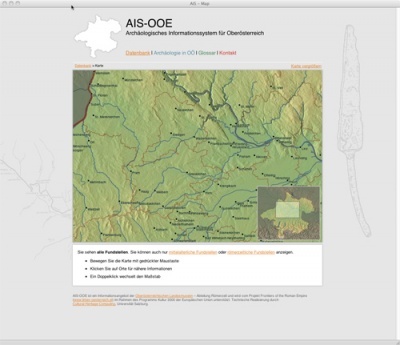 Interactive web-cartography forms another focus of CHC in the development of database driven information systems for archaeology and archaeometry. Maps are ideal tools for the exploration of information stored in databases. As commercial geodata are nearly unaffordable for academic projects, there is high demand for maps based on data available for free. A good source for such data are – for example – NASA satellite data. These basic data can be completed and optimized, e.g. by the use of data that are made available by other, maybe local or regional public services. The tools "MIA" and "MapViewCHC" help to create simply editable and platform independent map-applications that can easily be adapted and implemented into any web database environment. For example: navigation map of AIS-OOE (left): Map based on NASA satellite data, optimized with vector data that were kindly provided by DORIS (Digitales Oberösterreichisches Raum-Informations-System). Diese Seite wurde zuletzt am 5. November 2014 um 13:39 Uhr geändert.